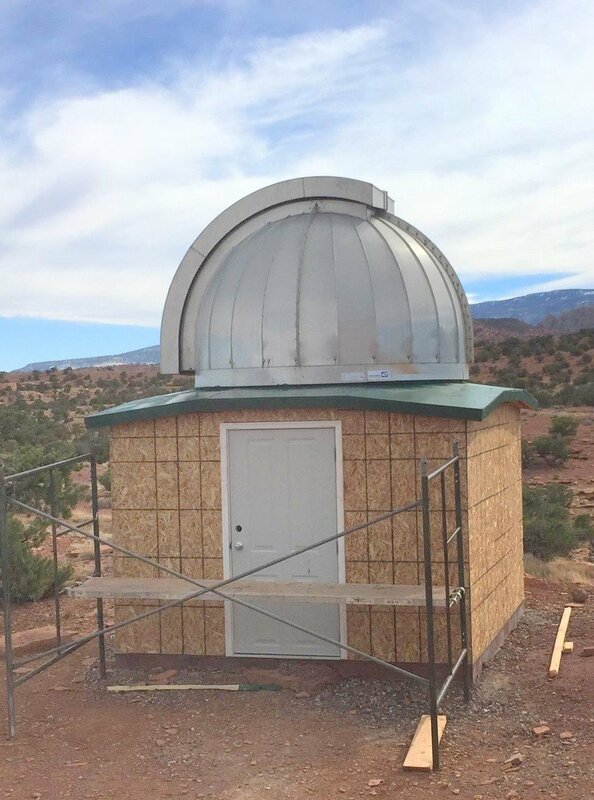 See Salt Lake Tribune article by Dawn House and Leah Hogsten on the observatory and the efforts of the town of Torrey, Utah to keep the night here. Joe Bauman, retired journalist for one of the two major Salt Lake City newspapers, the Deseret News, wrote up a nice piece on the project you can see here. Last week I sawed the tops off the uneven mount bolts and got the mounting plate on nice and level. Then help from John Lee, a game Torrey neighbor, to lift the mount up onto the plate. John did most the lifting. The black plate the mount is mounted to is about forehead high and I elected to get help, something I am always slow to do. John also hoisted the car battery into its container that you can see in the upper left of the photo above. He made it look easy and confided to me that he has been regularly working out at the high school gym. Thanks, John. At the top of the red mount is a black plate called a “Versa-Plate” that has the guide camera still on it and all the wired hanging from it. Getting it into the right position was one of the challenges I was worried about. When I took it down I was trying to get to the base plate to take with me and use for a jig to set the bolts in the pier when the cement for the pier was to be poured. I did not take notes or pictures because I had let myself be rushed. But, kindly to myself, I found indeed I had thought ahead enough to mark where the hex bolts went in the plate with little scratch marks and saved myself a lot of trial and error. The dome drive motor is installed and connected and works both ways with the hand paddle controller. Sometimes it works both ways. Some adjustment is needed. Perhaps the roller wheels could be straighter. If they need adjusting, I discovered my Audi car jack works perfectly to get the dome weight off the wheel. Apparently the base ring is more level on its new home that it was for my dad and I previously removed some shims from under a wheel that was making a high point using the car jack. The shutter motor is also installed and works perfectly with its hand paddle controller. Below you can see the first coat of roofing material has been applied. We used paint-able body putty to fill the gaps between the roof and the base ring. Run the Ethernet cable the rest of the way through the garage, and through the garage ceiling into the office floor. I will put an Ethernet connector plate on the office floor and one in the observatory on the other end. Temporarily re-balance the mount and find its “home” and “park” positions using the phenomenal software, called “SkyX” on the observatory PC. 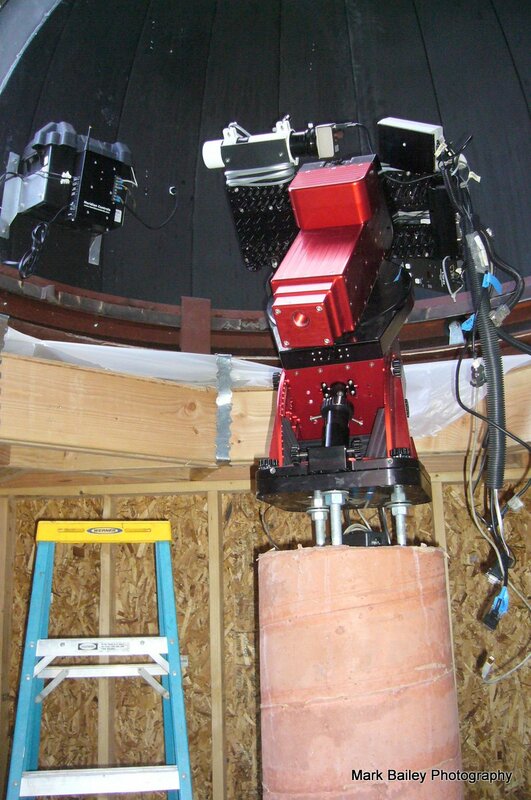 Remount the telescope and start polar aligning the mount. Because my dad’s setup is all about photography, I need to see what he has to temporarily reconfigure the scope for visual observing using a star diagonal and lighted cross-hair eye pieces. I need to be able to get stars in the cross-hairs to compare where they actually are to where the software thinks they should be and adjust the mount accordingly. With “Sky-X” this is done by building a computer model using sample stars versus the classic polar drift model I have been using for my outside Losmandy G-11 setup. I will also need to add a finder scope to make sure I am in the right ballpark of space. I hope there are still a diagonal and finder-scope in the stuff I have boxed up. I expect there will be. Once I have an alignment, remove finder-scope and star diagonal and then add the camera chain including the filter wheel and robotic focusers. Then start to figure out how it all works. In addition to wiring, the building needs more coats of roofing material, maybe three more, and to be stucco’d the same as the house, and the dead bolt installed. There is also roof edge flashing and facing, and some siding for the soffit yet to go. The contractor has been able to put in some quality time in the last couple of weeks. The base building was put together to the point we were able to put the dome on it a few days ago. Below are some photo updates. I borrowed the roof truss design from a blog by Edward Plummer and his “Muddy Paws” observatory. The challenge is to build something to hold up an 8 foot circle in the middle of a ten foot square. This worked out perfectly. The dolly I built did its job in getting the dome out to where we could pick it up with a front loader and carry over to the base building to be lifted on with a backhoe. This back lit shot shows the climbing webbing looped through eight eye bolts in the base ring and through a carabiner at the top to be hooked by a chain and hook draped from backhoe. There are a lot of places where tolerances could have been off but the dome, once centered over the hole and resting on the plywood roofing, was level, no adjustment required. Very impressive craftsmanship. The plastic is to keep the plywood roof dry until the roofing material arrives. The bolts on the photo at the right did not settle into the wet cement vertically as intended. I worried, until yesterday, when they straightened easily and without heat, that we might have to the bash the top of the cement pier down and re-pour to get the bolts straight. Here the mounting plate is shown in place square and level. Two bolts still need to be trimmed and the base will be ready for the mount. Pier on left will be in dome. Pier on right for outside observing. 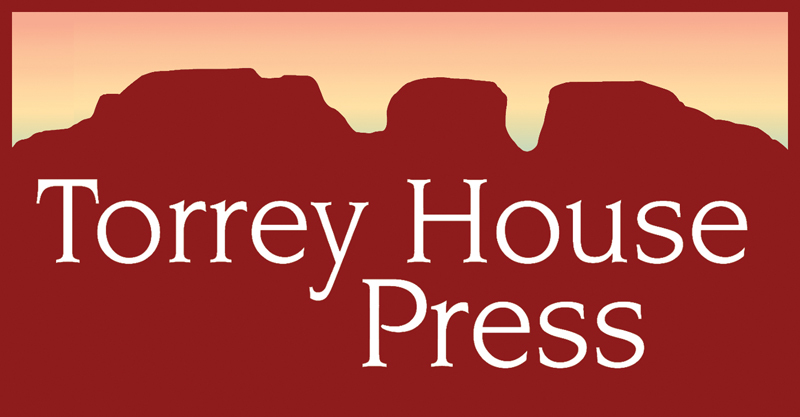 My goal is to get the Torrey House Alpenglow Observatory up and running to the point where my father and I can run it remotely together from his home in Salt Lake City. (See my previous post here.) I hope to image a deep sky object he has captured previously and see if we can see the difference made by high altitude and the clear, light pollution free skies of Torrey. The contractor I hired had other work in progress and said he likes to work on one project at a time as a general rule. Given that Dad is 84 and one never knows how much time one has, I asked the contractor to squeeze me in anyway. He said he would try. That was in September and the contractor’s other work expanded while he fell behind, which brought us to not much progress by November. Normally getting cement poured and properly cured in mid-November and even December would be problematic at 7,000 feet. I was starting the think we would have to wait for spring. Perhaps global warming was our friend. I am glad to now have the cement work complete, but would be willing to take a delay to have the global climate in a better place. While behind where I would like to be by now, we are ahead of where we might be with normal weather. The cement pads are poured, stamped and sealed. The windbreak wall is in and the piers are poured. The power and Ethernet cable are buried in conduits two feet apart and routed to the piers and observatory wall. There have been a couple of snags. The concrete forms for the wall were higher than the chute from the concrete truck could reach. So the contractor poured the cement into his front loader backhoe, climbed a ladder and shoveled all 10 tons in himself. He is in his early 60’s and professed to becoming a bit woozy. At one point as he maneuvered the tractor the scoop landed on the wall, bowing the wall and breaking on one end. Now, looking down the length of the wall there is a pronounced bow. I suppose we can claim improved aerodynamics. And if there was one place that required precision, it was in the setting of the bolts at the top of the piers. They need to fit into the steel plates the telescope mounts sit on, be oriented closely to true north, and be vertical. While I forgot to get a photo of my bolt template jigs, they were similar to these in the photo. I went to quite a bit of trouble and still, the contractor didn’t manage to set the observatory pier bolts in level. He has a four foot long steel “hicky bar” that he plans to use to bend the galvanized, steel bolts back into a vertical position. You can see how far they are off in the photo below. It is hoped that the bolts bend before the cement breaks. They are 3/4″ thick. Stay tuned. Notice the non-vertical pier bolts. Stay tuned for fix success. As my son, Nick, and I went to take the dome down I wondered how my dad put it up. The instructions say to assemble it on a flat surface and get a crane to lift the 700 pound assembly into place. That was not an option on the upper deck behind his home on the bench of the Wasatch Mountains in Salt Lake City, so he assembled it in place, with my sister’s help, on the base structure he custom built. It is even more impressive that at the time in 1984 my sister was only 14 years old. I called her to ask her what she remembered about how it was done. She said she had no idea. “All I remember was being up on a ladder, hanging on for dear life, and doing whatever Dad told me,” she told me, laughing. Not much help. Nick and I even wondered where the ladders would go. Could they rest on the dome? How heavy were the pieces? How would we secure things to avoid falling parts, ladders and bodies? 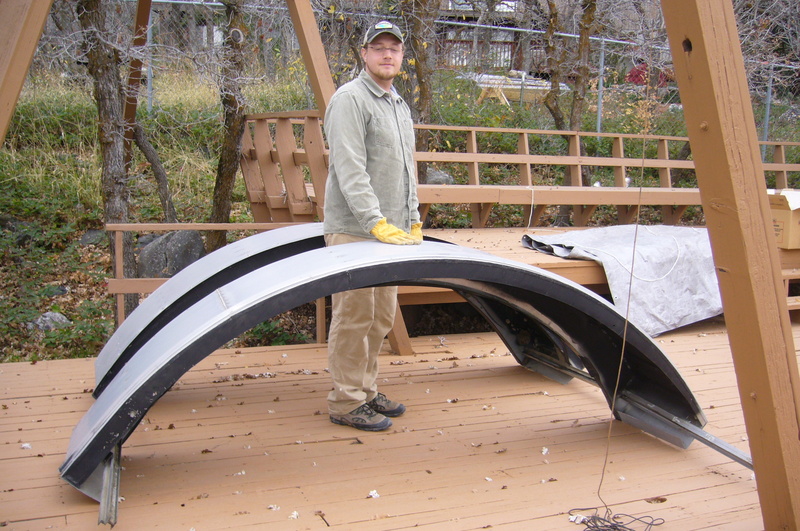 Nick with the newly removed observatory dome shutters. It turns out the dome is strong like an eggshell is strong. Sturdy when assembled, light and fragile in pieces. The ribs of the dome were plenty strong to rest a ladder on and even the shutters were so light Nick ended up ferrying them down the ladder on his shoulder holding them with one hand. Partially unloaded truck in Torrey. Snow in Salt Lake finally caught us before we could get the dome all the way down and the base structure carefully de-constructed. That meant a good number of trips up and down icy wooden steps to the upper deck. We managed, rented a 10′ moving truck, and including the base structure, which I did not plan to move when I reserved the truck, got it all moved to Torrey in late November. 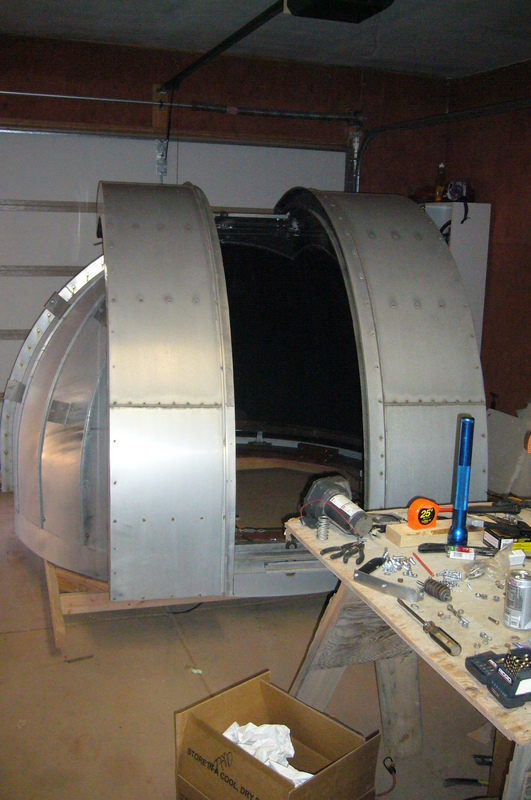 I built a 2×4 frame on coaster wheels to reassemble the dome on in the garage in Torrey. This time we will use a crane–probably the contractor’s backhoe–to lift the finished assembly on to a new base building. Dad’s base building was round with an 8 foot diameter, resulting in about 50 square feet of space. At his suggestion I am building a larger 10′ X 10′ square base building that will have twice the square feet. The contractor says he cannot start on it for at least a month. So probably two. The project is an honor to work on. As we take things apart, documenting as we go with notes and camera, I can see how my father solved problems and never cut corners. Once we have the dome back on its new home and all the telescope and electronic equipment reinstalled, I will need to figure out how it all works. More to come. In 1984 my father erected a full blown observatory in his backyard on the foothills of the Wasatch Mountains in Salt Lake City. He was in his early fifties then and my sister, who was only 14, helped him erect it. He named it the Alpenglow Observatory, created a website to catalog his deep sky photos, and worked on constantly improving it. I think of the project as his magnum opus. This month he asked me if I would like to move his masterpiece to Torrey. When he first asked, I balked. Kirsten had to kick me under the table. I wanted my father to understand I do not covet his equipment. I am proud to be using his first telescope and have progressed to where I am using it nearly to the full extent of its potential. I am satisfied with what I have. The gear my father has is vastly more expensive and advanced than what I am using. What I want is for him to enjoy the fruits of his efforts. But in his mid-eighties he professes that it is getting difficult. Kirsten immediately recognized Dad’s request as a great honor and gave me the “get with it” look. I got the picture and said I would move it for him. The complexity of Alpenglow has the upside that it is completely automated and can be operated remotely. My goal is that Dad will be able to get on his PC in Salt Lake, wake the observatory up in Torrey, rotate the dome, open the dome shutters, position the telescope, fire up the camera, acquire an object, focus the camera, and start taking pictures. The downside is also that the observatory is complex. I will be reverse engineering what he has built to figure out how it works, get it dissembled, moved, reassembled and functioning. It is thrilling to be taking the performance and capability of this facility to Torrey. It is sad that Dad is feeling too challenged by it in his accumulated years. I feel the obligation to make the most of the facility’s capability and am wondering how to do that. Blogging about the project will be thinking about it. First is the planning. The telescope in Salt Lake is mounted on a 12″ cement pier that comes up through his back deck. A similar pier will need to be built in Torrey. There is no deck in Torrey, so a cement pad out at the end of the driveway will probably be the thing. I would not mind also having a separate cement pier for my telescope set up but out at the end of the driveway it is windy. So that means add a windbreak wall. There needs to be power. That means finding the right source, digging trenches, outlets coming up through the new cement pads at the right places. 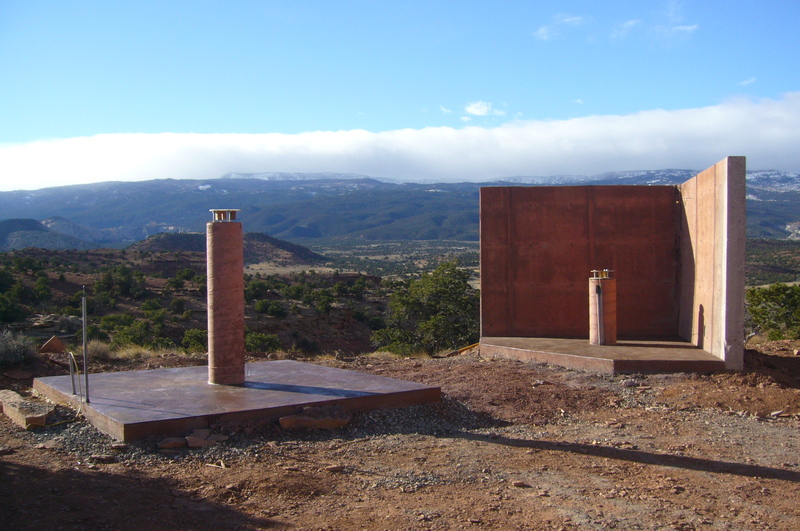 I do not believe a wi-fi signal will penetrate aluminum, of which the observatory building is comprised. Does the observatory need an Ethernet cable run to along with the power? How to elegantly or at least cleanly get the Ethernet cable from the router inside the house to outside the house? 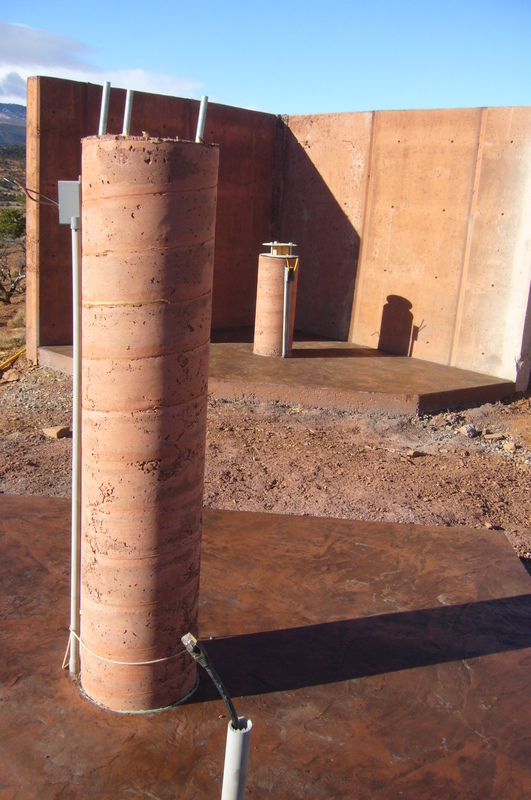 The cement piers need to be poured with mounting bolts embedded in the cement to fit the telescope mounts and in such a way that the mount faces precisely true north. There are challenges. I am also thinking about a name. Dad calls his observatory Alpenglow. At the foot of the Wasatch Mountains that name is very fitting. Not so much on the Colorado Plateau. Neighbors in Torrey who are into astronomy came up with “Observa-Torrey” for their site on Clear Dark Nights. What a great name! But it’s taken.